In a tepid first half, Chelsea were restricted to just a first-minute effort from Daniel Sturridge which was saved by Robinson. Blackburn almost went ahead in the ninth minute when Mauro Formica cut in from the right and crossed for Yakubu who stretched to prod the ball wide under pressure from the advancing Cech. The Blues 'keeper required seven minutes of treatment for a facial injury in the resulting clash with the striker, during which time the Chelsea medical team worked to stem the flow of blood. When play resumed, it was the home side who continued to press forward with confidence, with the increasingly impressive Ruben Rochina blazing wide from 20 yards. The lively Sturridge failed a win a penalty when he fell under the challenge of Christopher Samba in the box, then moments later his cross from the left was just too strong for Juan Mata in front of goal. Sturridge was caught narrowly offside racing onto a through-ball from Malouda then Lampard blazed over from 20 yards after a cross from Ivanovic. Villas-Boas, desperate not to drop points which could leave them even further adrift of the Premier League summit, replaced the ineffective Malouda with Fernando Torres at the break. Rovers started the second period in lively fashion with Hoilett crossing in the box towards Formica, whose chance was foiled when Terry stabbed the ball away. The visitors grabbed the lead in the 50th minute with only their second shot on target. Ivanovic turned inside Hoilett on the right and crossed for Lampard who directed a low header past Robinson. But Rovers should have equalised four minutes later when Cech parried a Pedersen free-kick into the path of Hanley, who drilled the rebound straight into the prostrate keeper. 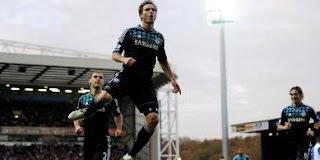 As the game belatedly sprang into life, Ramires had a goal-bound effort blocked in the box by Jason Lowe, then Lampard fired a long-ranger which was tipped over by Robinson. Chelsea's defensive frailties were evident again in the 67th minute when Yakubu wriggled between Alex and John Terry before hitting a curling shot which Cech saved well. Rovers had yet another chance to equalise in the 70th minute when Rochina found Formica in the right side of the Chelsea box and while his shot beat Cech it was booted clear by Ramires. Then came Rovers' big chance four minutes from time when Pedersen swung in a corner and the ball ricocheted off the back of Ivanovic's head and against the underside of the bar. Chelsea should have wrapped the game up in injury time when a one-two between Torres and Cole gifted the Spaniard the simplest of chances which he somehow spooned over the bar. Ultimately the result left Rovers rooted in the bottom three while a plane circled Ewood Park trailing a banner which bore the slogan 'Steve Kean Out'.